Abstract: This sixteenth episode is an exclusive celebration of the release of The Dangerous Philosophies of Michael Jackson: His Music, His Persona, and His Artistic Afterlife, which is released today, 30th September, 2016. In this last interview of the series with the author Elizabeth Amisu, editor of The Journal of Michael Jackson Academic Studies, Karin asks several questions about the process of becoming published with a mass-market academic publisher, and Elizabeth also answers questions from official @MJAS29 journal Twitter followers. Merx, Karin, and Elizabeth Amisu. 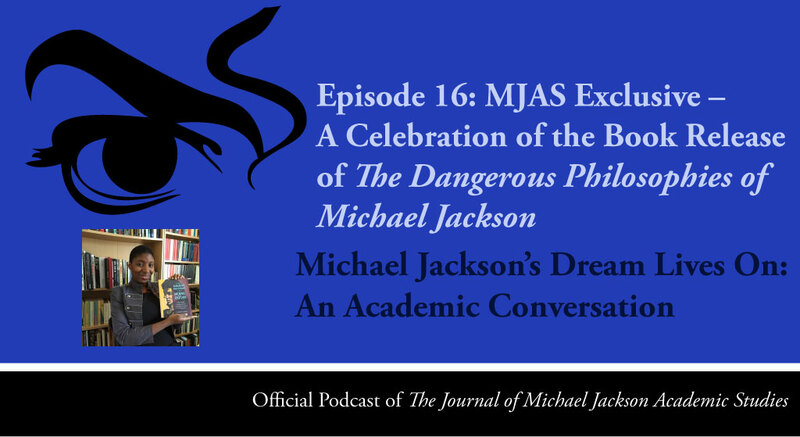 “Episode 16 – A Celebration of the Book Release of The Dangerous Philosophies of Michael Jackson” Podcast, Michael Jackson’s Dream Lives On: An Academic Conversation 3, no. 1 (2016). Published electronically 30/9/16. http://michaeljacksonstudies.org/episode-16/. 1. A lot of people would love to publish books, you were able to get a contract with one of the biggest academic publishers in the world ABC-CLIO, your dream came true. Tell us what you did to get this contract, what did you have to do for that? 2. When you started with The Dangerous Philosophies, did you have any misgivings about the process? 3. During your research for the book you learned a lot about Michael Jackson. You started to deliver this knowledge into a course, or courses. What inspired you to teach Michael Jackson? 4. How can Michael Jackson Studies be effective in schools and Universities? 5. If you had a chance to talk to Michael Jackson, what three questions would you ask? 6. Who are your biggest artistic, literary and musical inspirations? 7. Are you planning to write further on Michael Jackson after this enormous accomplishment? 8. 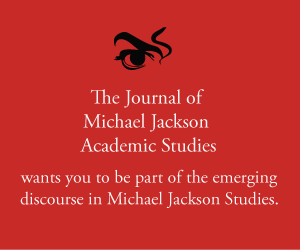 What advice do you have for those wishing to study Michael Jackson from literary, or cinematographic perspective or even want to write an academic book like yours? 1. I’d love to ask you about the poetic side of Michael Jackson. I believe that this side of him is under appreciated and I would like to know your input on that. 2. What is the song in your opinion that let this side of his artistry shine the most? 3. What is your favourite poetic song by him? 4. What made you want to write this book? 5. What do you want the readers to get out of it? 6. What was the easiest and hardest part of doing the book? 1. Amisu, Elizabeth, “Sacerdos: The Sacerdos Mysteries Book 1”, Writing Eliza, 2012. http://elizabethamisu.com. 2. Amisu, Elizabeth, “Arcane Rising: The Sacerdos Mysteries Book 2”, Writing Eliza, 2012. http://elizabethamisu.com. 3. Amisu, Elizabeth, “Ripe Earth: Ripe Earth Trilogy Book 1”, Writing Eliza, 2016. http://elizabethamisu.com. —Episode 11 – Author & Text: ‘The Dangerous Philosophies Of Michael Jackson’ Pt. 1. –Episode 12 – MJ Academy: ‘The Dangerous Philosophies’ Pt. 2. —Episode 15 – MJAS Exclusive: Live From Kingvention 2016. 7. Smit, Christopher R., ed. Michael Jackson: Grasping the Spectacle, (Ashgate, 2012). 8. Amisu Elizabeth. ‘Recontextualizing Michael Jackson’s Blackness’, The Dangerous Philosophies of Michael Jackson: His Music, His Persona, His Artistic Afterlife, 87-95, (Praeger, 2016). 9. Certified Michael Jackson & Black History Online Video Course, http://onlineartseducation.co.uk/mjblack/. —Episode 8 – MJAS Exclusive: Michael Jackson & Prince Part I. —Episode 9 – MJAS Exclusive: Michael Jackson & Prince Part II. 12. Amisu, Elizabeth. “‘Bad (1987)’.” The Journal of Michael Jackson Academic Studies 1, no. 2 (2014). Published electronically 22/7/14. http://michaeljacksonstudies.org/bad-1987-2/. 13. J.K Rowling, author of Harry Potter books, http://www.jkrowling.com/. 14. Joss Whedon, Writer, Producer, Director, http://www.imdb.com/name/nm0923736/. 15. China Mieville, author of SF & Speculative Fiction, http://chinamieville.net. 18. Finding Dory, Animation by Pixar Films, http://www.pixar.com/features_films/Finding-Dory. 19. William Shakespeare, poet, playwright, https://www.rsc.org.uk/shakespeares-life-and-times. 20. Arthur Miller, playwright, essayist, https://www.neh.gov/about/awards/jefferson-lecture/arthur-miller-biography. 21. Jason Mraz, singer, songwriter, http://jasonmraz.com. 22. John Mayer, singer, songwriter, http://johnmayer.com. 23. Peter Jackson, Producer, Director, Writer, http://www.imdb.com/name/nm0001392/. 24. Howard Shore, Film Composer, http://www.howardshore.com. 25. Dario Marianelli, Film Composer, https://en.wikipedia.org/wiki/Dario_Marianelli. 26. Quentin Tarantino, Writer, Actor, Producer, http://www.imdb.com/name/nm0000233/. 27. Certified Michael Jackson’s ‘Dangerous’ Online Video Course, http://michaeljacksonstudies.org/dangerous/. 27. Easiest Chapter: Amisu Elizabeth, ‘Critical Survey’, The Dangerous Philosophies of Michael Jackson, His Music, His Persona, His Artistic Afterlife, 9-19, (Praeger, 2016). 28. Hardest Chapter: Amisu Elizabeth, ‘Horcruxes: Michael (Split Seven Ways) Jackson’, The Dangerous Philosophies of Michael Jackson: His Music, His Persona, His Artistic Afterlife, 127-141, (Praeger, 2016).